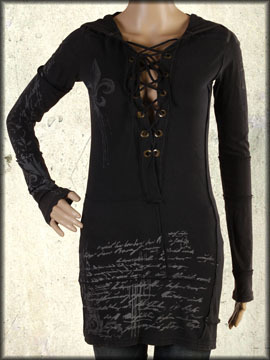 Bejeweled Dust Womens long sleeve tunic hoodie features large metal grommets and corset style lacing up the front. Ornate script lettering near the hem, The back features ornate flowers, filigree and script on the back and hood. This top is cut longer in length and looks great paired with denim or leggings. Very soft and comfortable. Vintage washed. Color: black..